We will explain WonderLookPro's inside design regrading color management. It is not necessary to be understood by all users, but it will help you to understand the intention of every functions or make you easy to understand how to use this software. WonderLookPro is designed based on the ACES archtecture. We can even say that without ACES, WonderLookPro development can not be achieved. Most simple explanation is like this. ACES archtecture starts from IDT, which remove the dependency of camera, next move to RRT, which create good image for the reproduction, finally proceed to ODT, which creates monitor device dependent code value. ACES is seeking ideal motion picture making framework, which is not dependent any device, which can achieve common look availability, and has no clip, no archfact or noises. WonderLookPro perform variety of math calculations regarding color to create LUTs. Here is the outline of the calculation. First, "Intput Transform" will be calculated to create ACES color which do not dependent on any device, and has linear color space. This step is not chage color itself, but change the method of representing color to so-called ACES. For example, if you are going to feed camera image signal as input, you should select the conversion of the camera signal into ACES as Input Transform. This conversion which converts camera signal to ACES is called IDT(Input Device Transform). This transform is just the inverse transform of the camera, in which the original scene information will be transformed to electric signal, in other words, the backword conversion to restore original image information from camera created signal. As you know, original scene color is not dependent from camera. WonderLooPro is capable of using IDTs which was created by TVLogic development team by measuring real camera device profile. In some cases, you might feed rendered image targeted for Rec709, which is ready for broadcasting. In this case, WonderLooPro converts Rec709 signal to linear by inverse conversion of the gamma, and primary RGB will be converted from Rec709 to ACES primary as well, to create ACES image. We call this transfrom ODTinv(Inverse transform of Output Device Transform). There are a lot of standards for monitor color space, and every color space has different meaning for the numbers. WonderLookPro will convers these numbers to one standard ACES, which don't depend on any spefcific monitor color space. These are the objective of Input Transform. 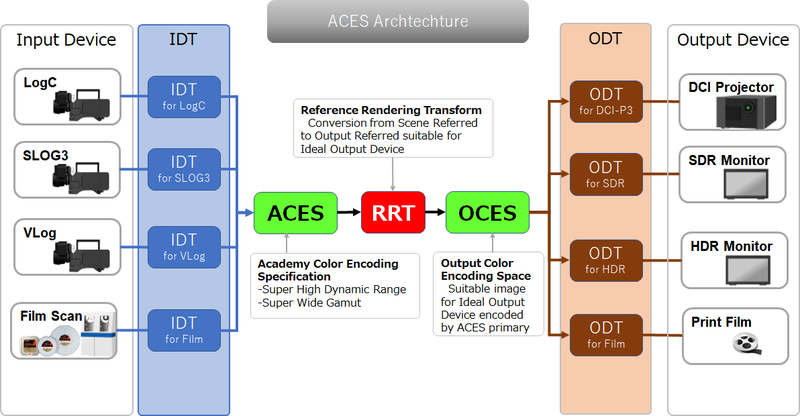 ACES is stands for Academy Color Encoding Speciﬁcation, which was develped and standarized by AMPAS (Academy of Motion Picture Arts and Sciences), and which is the core color space of ACES standard. This color space is designed to express all of the visible colors in positive values, and it's convertible with CIE1931 XYZ which is the standard color expression in color science. On this step, we will add various tranfrom to device independent ACES colors. Contrary to input transform, the objective of this transform is to change the color itself, I mean, the color will be changed for absolute meaning. The role of this transform is "to add the transform to convert the color more preferable". WonderLookPro provides lot of presets of the transform, various rendering including film looks, preset look libraries, or simple and powerful user interface for color correction. These transform will be defined to device independent ACES, so it can be applied to any camera or any monitor color space. It is on of the big benefit of WonderLookPro's color management archtecture. The last block, "Output Transfrom" is to convert from colors coded in ACES, which is device independent, to code value which is ready to send to specific display device. When the targeted device is the monitor, we call it ODT(Output Device Transform). Rec709/2.4 or Rec2020/HLG are the typical example of the targeted monitor color spaces. You can target camera color space. For example, you can convert ARRI's LogC to SONY's SLOG3, by using LogC IDT as input transform, SLOG3 inverse IDT as output transfrom. We call IDTinv for this inverse IDT. WonderLookPro calculates colors like these manners to make LUTs. The most important parameters are Input Transform and Output Transform. You should aware what kind of color space signal you are going to use as input, what kind of color space you are going to create. Once you have set both input/output transform correctly, you can focus on to create your color while observing the result by using rendering or color correction.